Do you want your kids to have the best start to their life? Do you want their education to be a good one? Then put this free LearningEdge Tutoring Coupon to use and start saving your cash while building your child’s future. 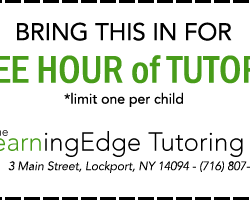 With this Printable LearningEdge Tutoring Coupon you can get one whole hour of free tutoring from LearningEdge for your child! So Print off this FREE coupon and start making you money go further this spring time!